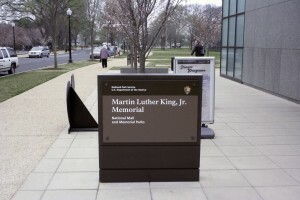 The Design-Build team for the memorial to commemorate the life and work of Dr. Martin Luther King, Jr. consisted of McKissack and McKissack, Turner Construction, Tompkins Builders and Gilford Corporation known as (MTTG). The site is adjacent to the President Franklin Delano Roosevelt Memorial on the Tidal Basin and in a direct line between the Lincoln Memorial, where Dr. King delivered his famous “I Have a Dream” speech, and the Jefferson Memorial, symbol of liberty and democracy. The memorial honors Dr. King’s contributions to world peace through non-violent social change. Natural elements such as water, stone, and trees underscore the themes of justice, democracy, and hope. Quotes from Dr. King’s sermons and speeches capture the essence of his message in the commanding tenants of the American Dream – Freedom, Democracy, and Opportunity for All. 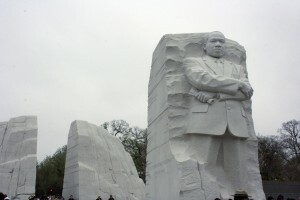 The centerpiece of the Memorial, the “Stone of Hope”, features a 30-foot likeness of Dr. King. Grasscrete was installed and is used for access to the back of the auxiliary building which houses the Martin Luther King Jr. bookstore, restrooms and a ranger station. The area is approx 2,000 square feet with the voids being planted with grass. The Grasscrete pour used a Buff Integral Color to provide a cohesiveness to the surroundings. 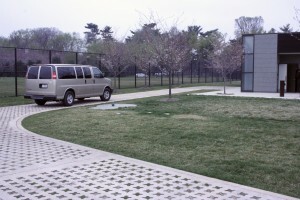 The Partially Concealed Grasscrete installation minimizes the non-pervious surfaces and includes a letdown between the sidewalk and street to allow daily access for the Park Ranger and maintenance vehicles. Share the post "Dr. Martin Luther King Jr. Memorial Auxiliary Building Grasscrete Pervious Access Road"